Product prices and availability are accurate as of 2019-04-17 17:13:38 UTC and are subject to change. Any price and availability information displayed on http://www.amazon.com/ at the time of purchase will apply to the purchase of this product. 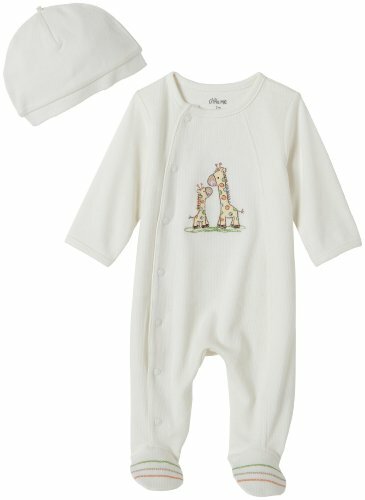 Little Me Giraffe Footie with Hat Ivory Little Me Neutral Giraffe footed coverall with front snap closure. 100% cotton machine washable. Solid Ivory ribbed coverall with giraffe art applique on chest and foot treatment with a matching hat to complete the look. Full inseam snap closure allows for easy changing. Size Length Weight Preemie to 18" (46 cm) to 5 lbs. Newborn to 21" (53 cm) to 8 lbs. 3 months to 24" (61 cm) to 12 lbs. 6 months 24" to 27" (61 to 68 cm) 12 to 16 lbs. 9 months 27" to 29" (68 to 74 cm) 16 to 18 lbs. 12 months 29" to 31" (74 to 79 cm) 18 to 23 lbs.